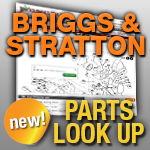 Replace your Briggs and Stratton Intake Valves and Exhaust Valves with new ones from Jack's. We have replacement valves for the 4-cycle Briggs & Stratton engine in your lawn mowers, snow blowers, and any other power equipment. To keep your engine running in top notch condition, select your new intake or exhaust valve below.